Little People characters get the fun rolling in a brand new way! Wheelies are cool kid-sized vehicles that fit perfectly in little hands. Each vehicle has a favorite Little People character built right in! 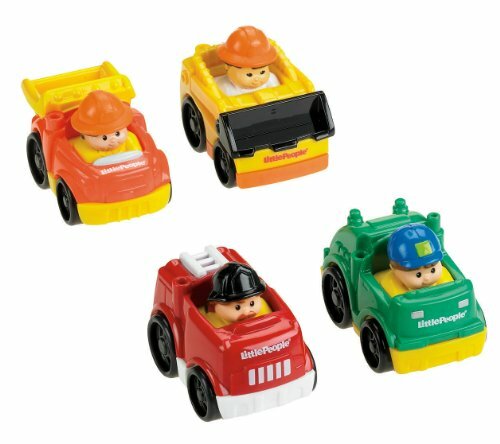 Set includes 4 vehicles: Construction Loader vehicle, Dump Truck Vehicle, Fire Truck vehicle, and green Recycling Truck vehicle. Add this set of vehicles to the Little People Stand 'n Play Rampway for even more action and excitement. For age 1 ½ to 5 years.